I've decided to give get back into a normal routine here because I've literally unplugged from the internet for a little. I needed some time away to think things through etc, you can read more on my main blog. I want to show you the best pizza you could ever prepare for your family. I mean, they will be shocked at the end result and will no doubt leave them with mouths hanging open, amazed and speechless. This pizza...............Ohhhhhh this pizza is amazing. Pepperoni, cooked nice and crisp.....a nice golden brown crust......YUM.MY! Ahhhhh, bet you're dying to know how to prepare such a beauty, aren't you? Well, it's pretty easy actually....you pull it out of the box, you warm up the oven to 400 degrees, then you pop in the pizza and go get on Skype with your family in South Africa. Just talk and talk and laugh and joke and talk some more and then proceed to take them around your whole house with the laptop in hand so they can see everything you're doing.....all while this delicious pizza is cooking. Then come back into the kitchen an hour later and say "Oh pizza is done". I will NEVER live this down. This is my FIRST time ever burning anything that I've cooked. HA! Note: Don't try this at home. 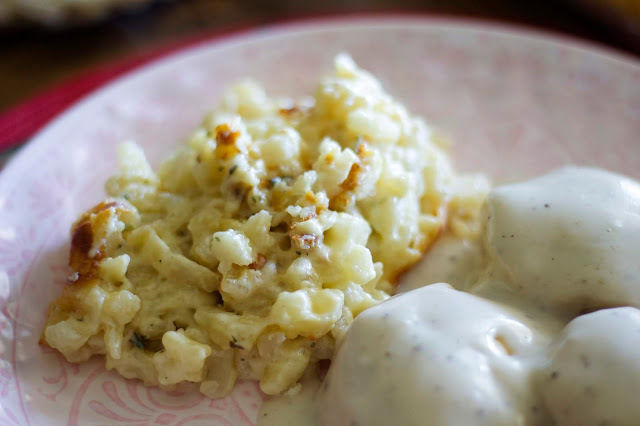 First I'll start by saying that the reason I'm putting the recipe up today is because I hadn't realized that it wasn't on my blog, so when one of my readers asked me on Facebook if I had the recipe, I told her that I would put it up for you all. 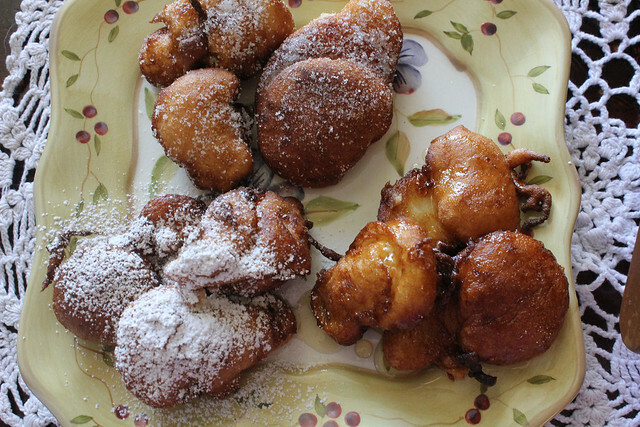 Secondly, I'll have to say that the first time I had Malasadas was when I was in high school, over at a friend's house. 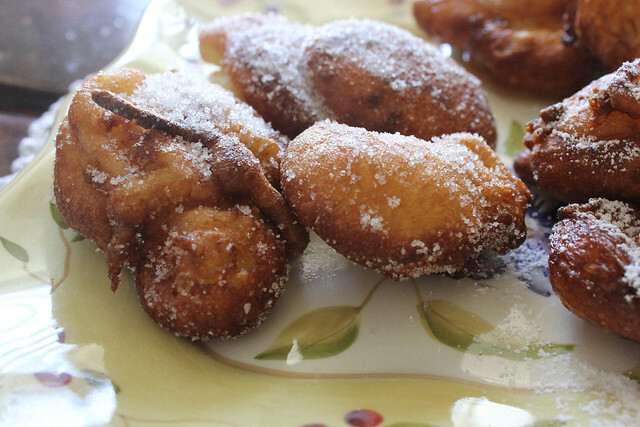 They were from the island of Madeira and I remember many afternoons a couple of us girls would go over to her house and make these and then sit and snack on them all afternoon long. It brings back such fond memories, but it also makes me sad because my friend Ana, whose house we had these at, has since then passed away, matter of fact not long after we graduated from high school. 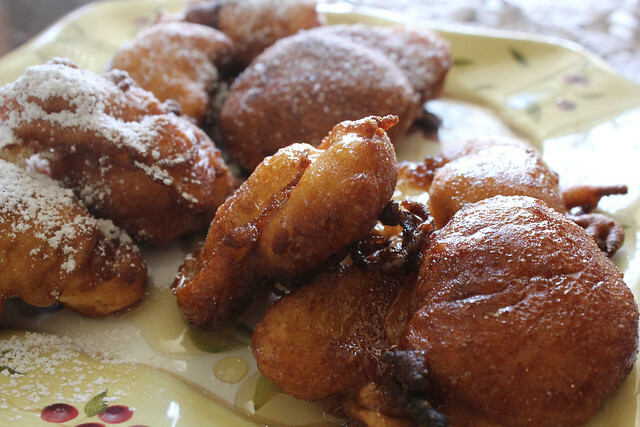 Since then I've made these a couple of times and not until I came to live in the USA did I realize that many people seem to think of Malasadas as this doughnut dish from Hawaii, which really confused me since their idea of a Malasada is what I would actually call a Bola de Berlim. 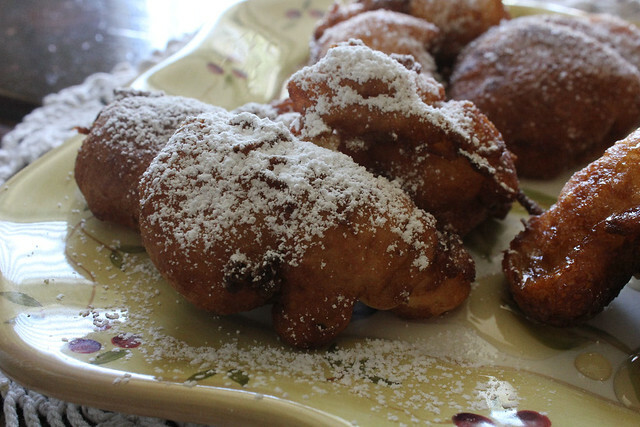 A donut filled with cream custard inside.....but, I guess different folks, different recipes and all that. 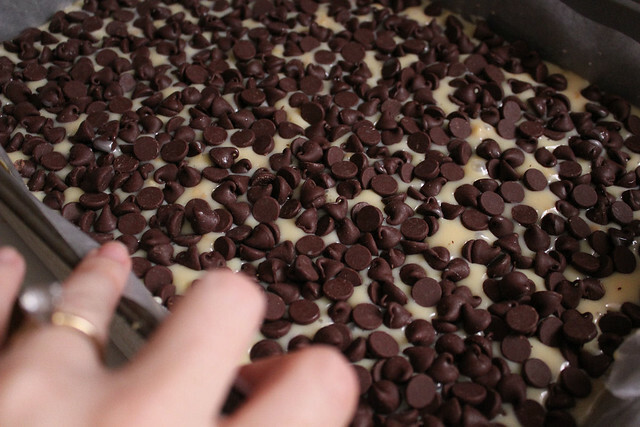 In a big bowl, add 1 cup of warm milk and the yeast, stir well. In a medium bowl, add the flour, salt and sugar, combine well and then add 2 cups of that flour mixture into the milk and yeast bowl. Beat well until smooth. Next, add in the eggs 2 at a time, a little bit more of the milk and a little bit more of the remaining flour mixture, keep mixing well until all ingredients are combined. Cover and let sit for about an hour. be careful not to splash. I always manage to burn myself when making these. 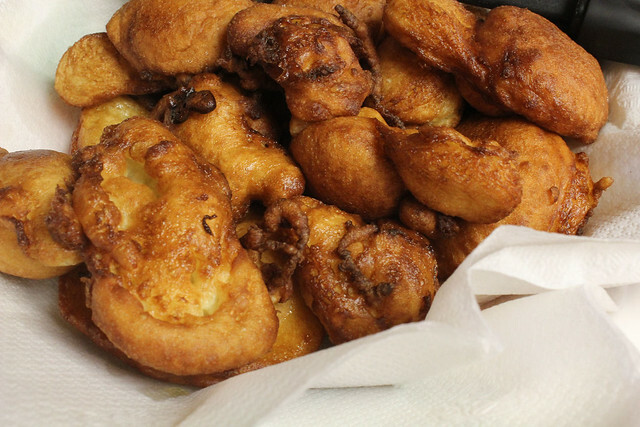 They will fry up really fast, so within a few seconds, turn them over and after a few seconds more, remove them onto a plate lined with paper towels. or sprinkle some powdered sugar on top. 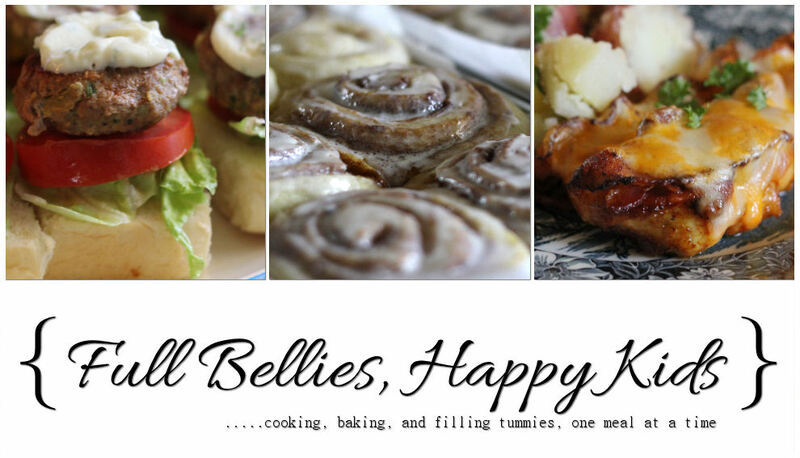 When I came across this recipe at Confessions of a Foodie Bride I thought "why didn't I think of that?". 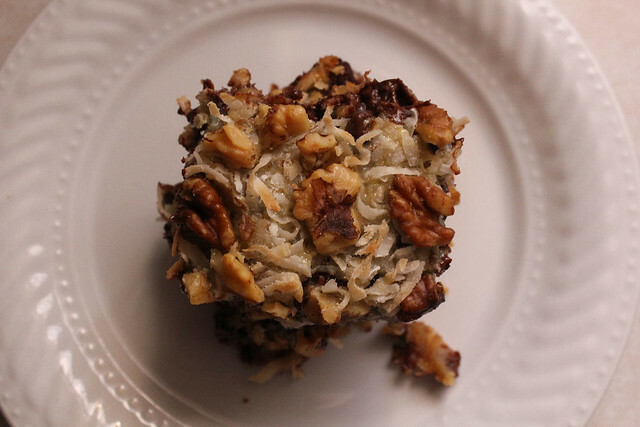 It's so easy but such a great snack you will wonderful why you didn't think of it either. 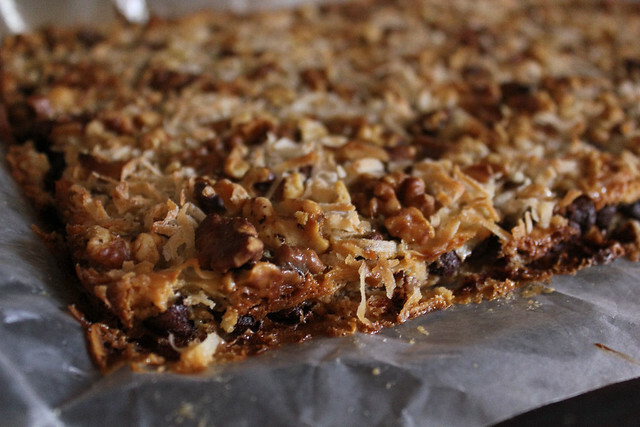 Needless to say, I made it for lunch today and within 10 minutes there was only 2 small pieces left which, by the way, have now been eaten by the kids, so there is nothing but crumbs.....and the thought that I need to make it again. I took a shortcut and used biscuits instead of the pizza dough, next time I'll make my own pizza dough and I think it will be just as good. 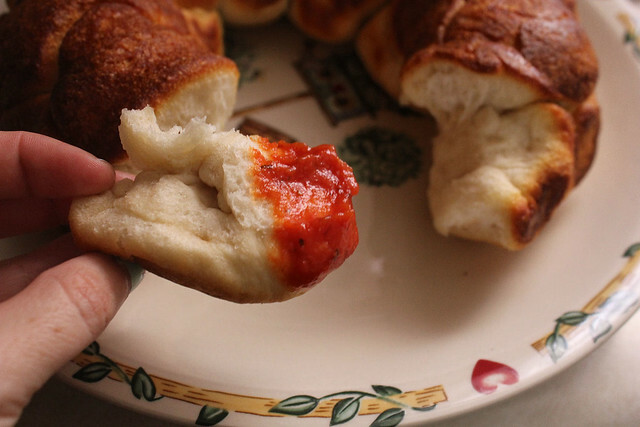 You can take the long route and make your favorite pizza dough and marinara sauce, or the short route and pick up your favorite pizza dough and red sauce from the store. Heat garlic and butter over medium heat just until the garlic begins to brown. Remove from heat and let sit. Lightly brush the inside of a bundt pan (or other oven-safe dish) with garlic butter. 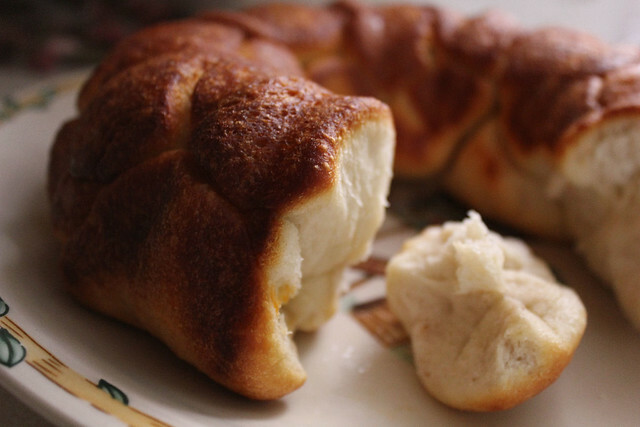 Pull off large marble-sized balls of dough and flatten (a kitchen scale makes this very easy). Top with a slice of pepperoni and a cube of mozzarella. 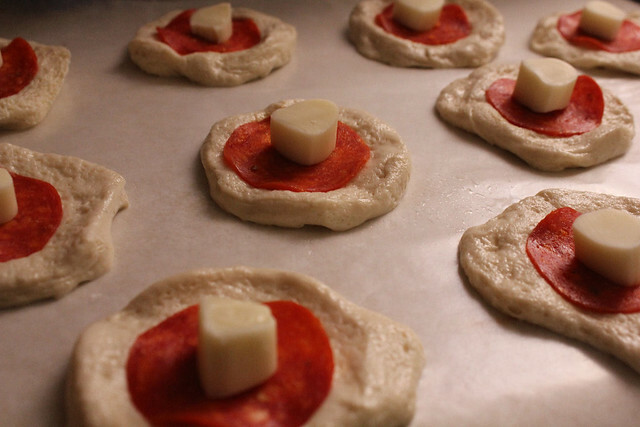 Wrap the dough around the pepperoni and cheese, pinching well to seal. Very lightly brush the pizza ball with garlic butter and place into the bundt pan (I dabbed the pizza balls on a butter-dipped silicon brush to keep butter use low - there will be 1+ Tbsp leftover - and my hands butter free. 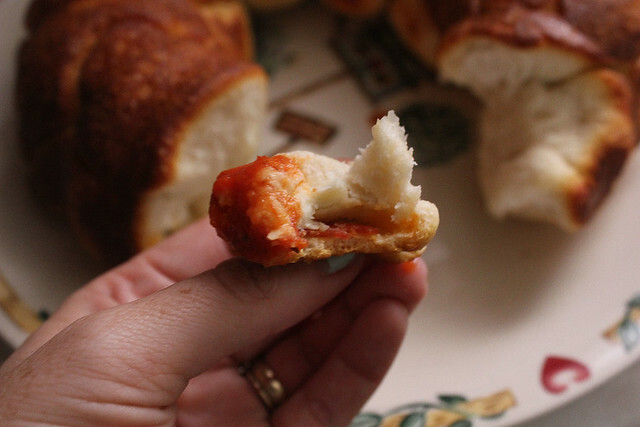 Buttery hands make it hard to get the pizza balls to seal). Repeat until all of the dough is used. 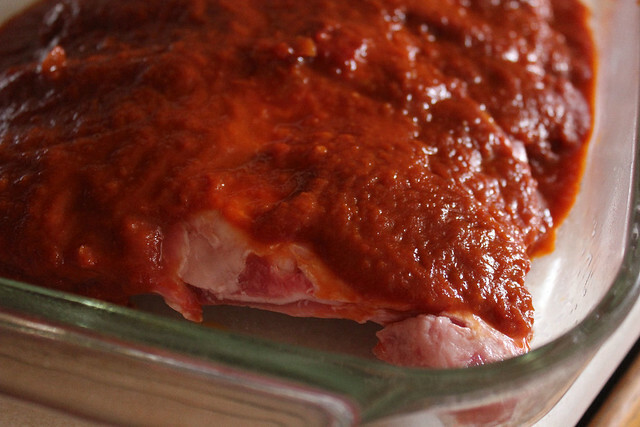 Cover and let sit for 30 minutes, while preheating the oven to 400. Bake for ~35 minutes, until the top is very brown. Remove from the oven and let sit for 10 minutes. Turn out onto a platter and serve with warmed marinara sauce for dipping. 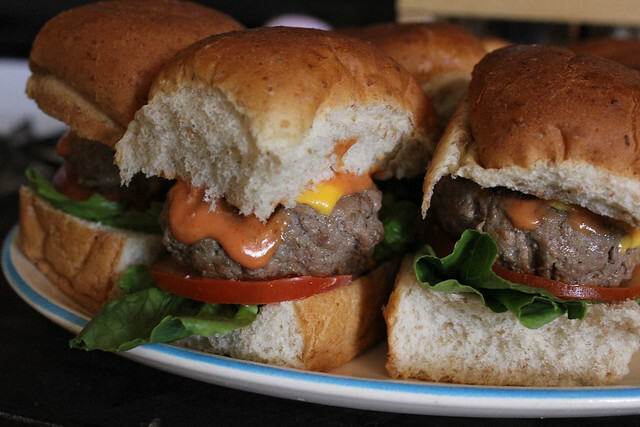 I love sliders, I think they're not only delicious but such a fun way to present burgers and there's something about the size that makes it just the perfect bite, for me at least. 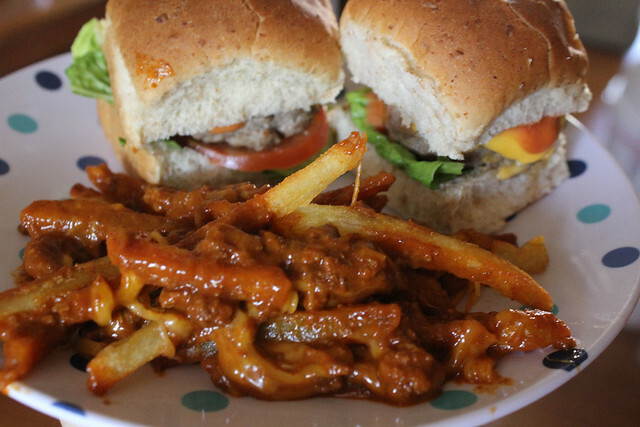 These are just yet another variation on these popular burger bites. Mix the ketchup, mayo and mustard well and set aside. 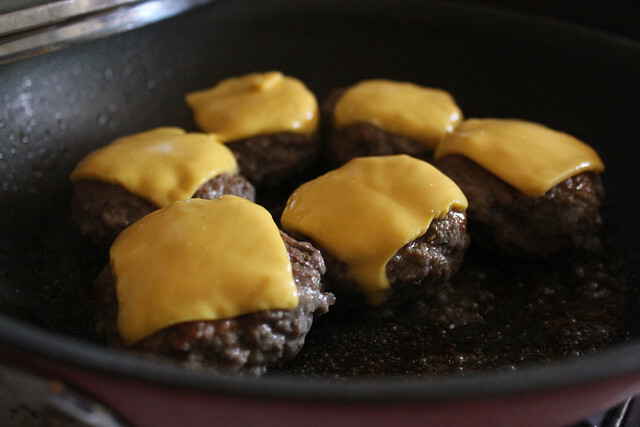 In a bowl, mix the beef and the rest of the ingredients, divide into 12 parts, shape into small patties and grill or fry in a skillet. 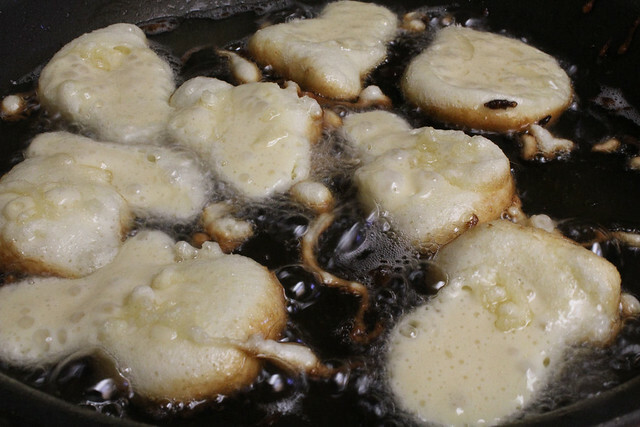 I fry them for about 5 minutes, then flip them over and fry for another 4 or so minutes, add a little slice of cheese and cover with a lid for about 30 seconds or until cheese is melted. 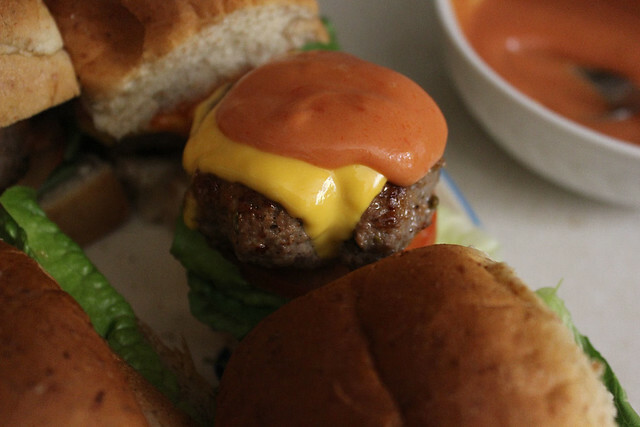 Split the dinner rolls in half, on the bottom bun put a slice of lettuce, a slice of tomato and then top with the burger, add a teaspoon or however much you want of the sauce and top with the top half of the bun. which are so easy to make. 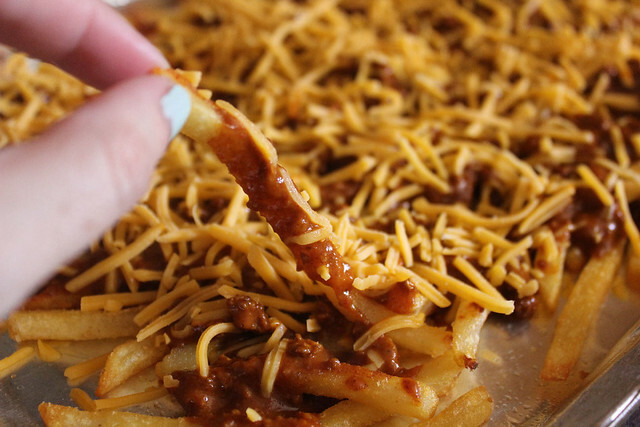 Just bake some frozen fries, warm up a can of your favorite chili or use leftover homemade chili, sprinkle shredded cheese on top and enjoy. On our recent trip to Tombstone, one of the souvenirs I picked up was a cookbook called Cowboy Cookin'. 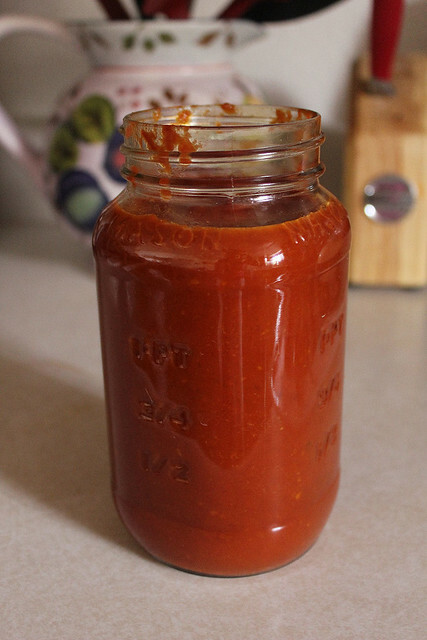 After browsing through the recipes, which I'm hoping to try soon, I came upon this one for Barbecue Sauce and it immediately caught my eye. Having some ribs to cook for dinner I thought that it would be the perfect time to try this sauce. It has to cook for 2 hours, so if you're making it for dinner, be sure to start it early in the morning. 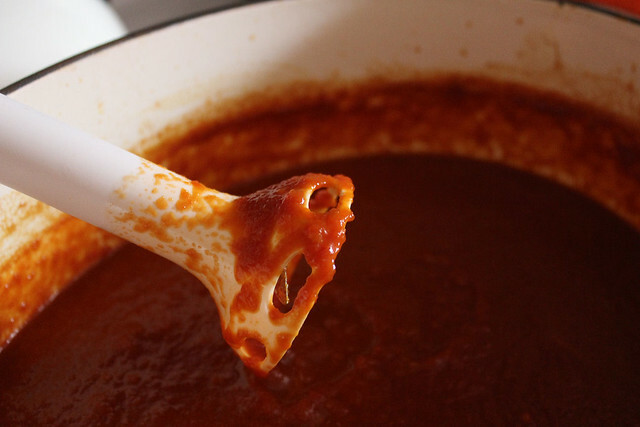 Combine all ingredients in a large sauce pan. Bring to a full boil over medium heat stirring occasionally. Reduce to a low heat. 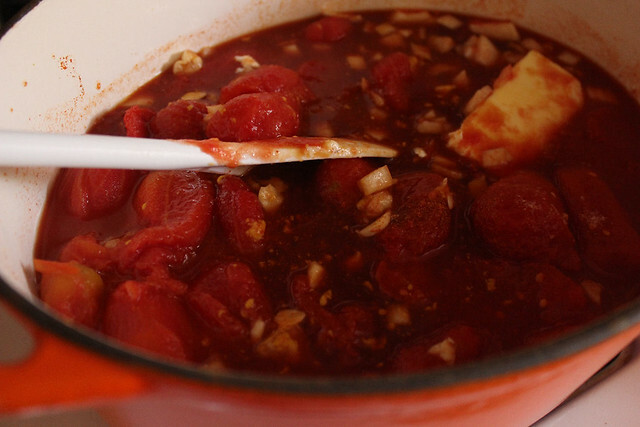 Cover and cook for about 2 hours, stir occasionally, until sauce has thickened and all ingredients are well blended. Sauce will turn very dark. Apply to rib-eye steaks or ribs as required. Note: It doesn't tell you to do this, but I used my immersion blender to puree everything. 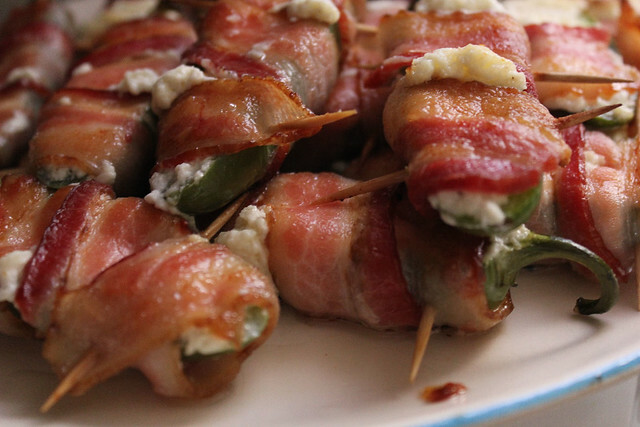 I love appetizers but I love them even more when I can just make a whole meal out of them. 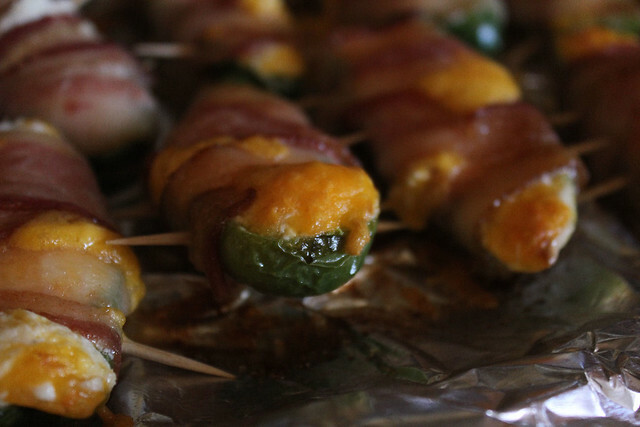 These are very filling and definitely good as a weekend dinner. They are seriously addictive and I dare you to eat just one or two and walk away, because I tell you, you will be eating them over and over and over and literally begging yourself to stop. Or maybe that's just me, I don't know, I'm still trying to stay away from them but I may just lose that battle and go grab another one in the kitchen. 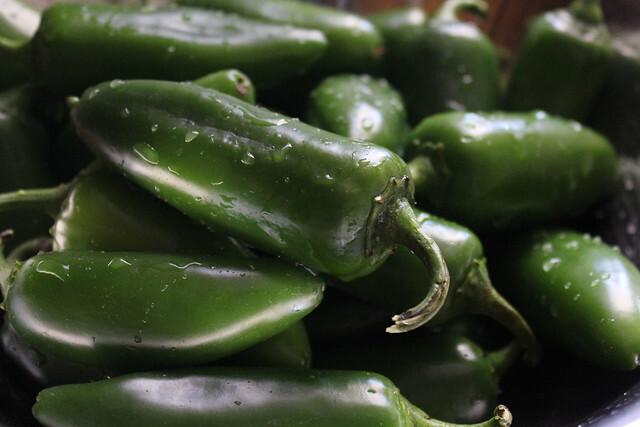 Quick tip, just use some gloves if you're going to be working with the Jalapeno's, don't do what I did the first time I made them which was use no gloves and then proceed to scratch my eye. YEAH, not a happy moment. 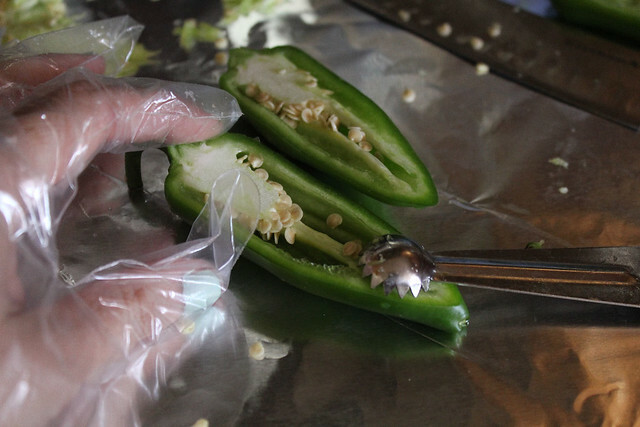 Cut stems off of peppers and cut them all in half longways. 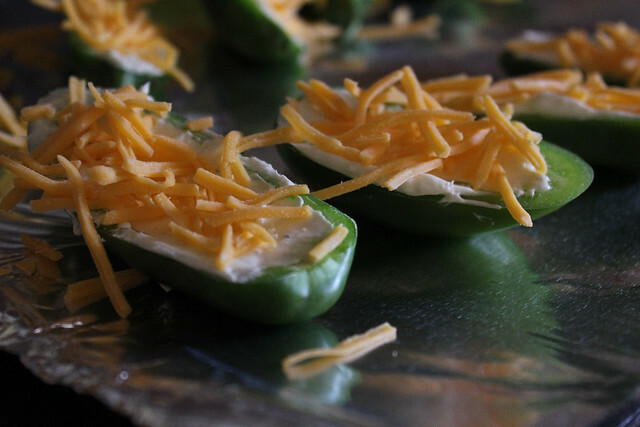 Fill each pepper with cream cheese and sprinkle cheddar cheese on top. 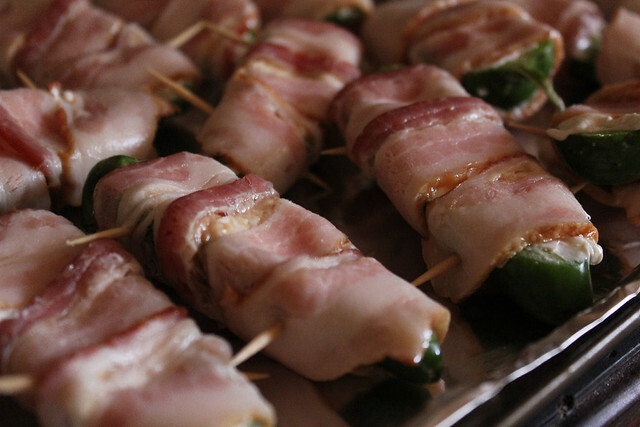 Wrap 1/2 slice of bacon around each pepper half. 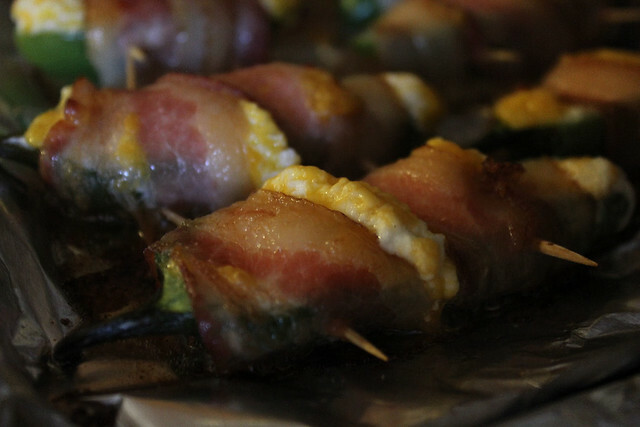 Place on baking sheets and place in 450 degree oven for 10 to 15 minutes or until bacon is fully cooked. Remove and serve warm. 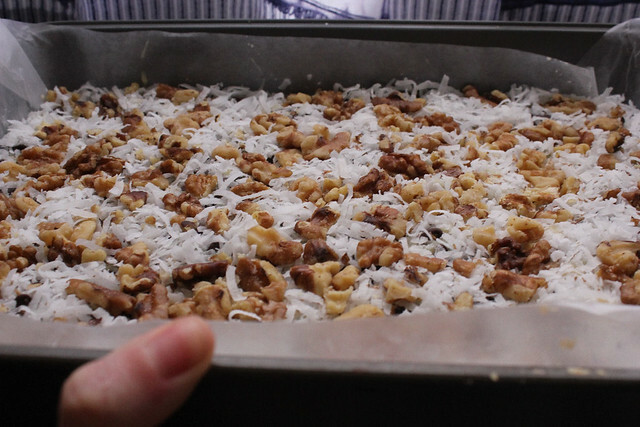 Have a batch of Magic Cookie Bars baking in the oven. I don't think there's anything that I can say about these that you haven't heard before, for the most part when you talk about them you are usually met with "Oh yeah, I remember eating those when I was little".....or "Oh now those bring back memories". 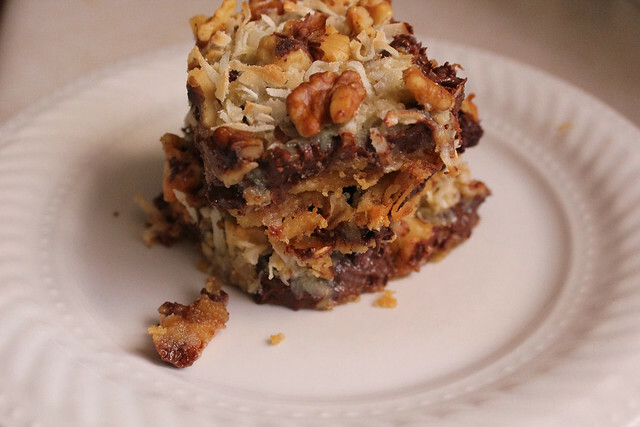 So I'm going to say nothing else, I'm just going to let YOU reminisce about what Magic Cookie Bars remind you of. Heat oven to 350 degrees F (325 degrees for glass dish). 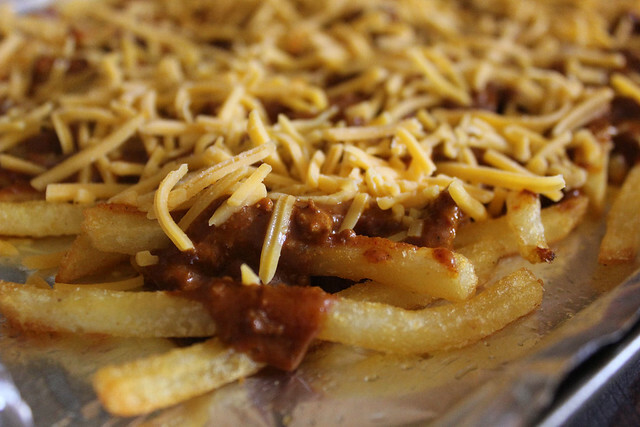 Coat 13x9-inch baking pan with no-stick cooking spray. 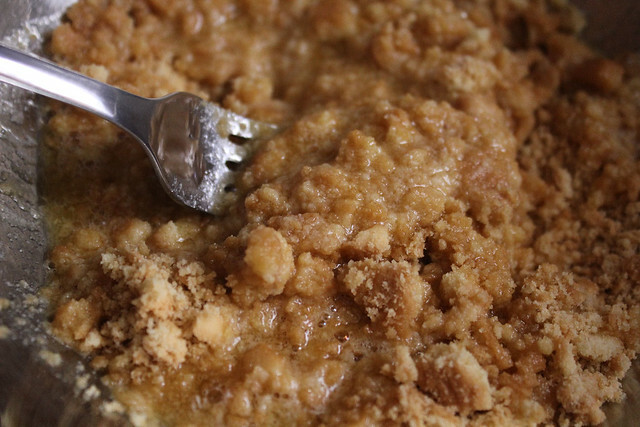 Combine graham cracker crumbs and butter. Press down firmly with a fork. Cool. 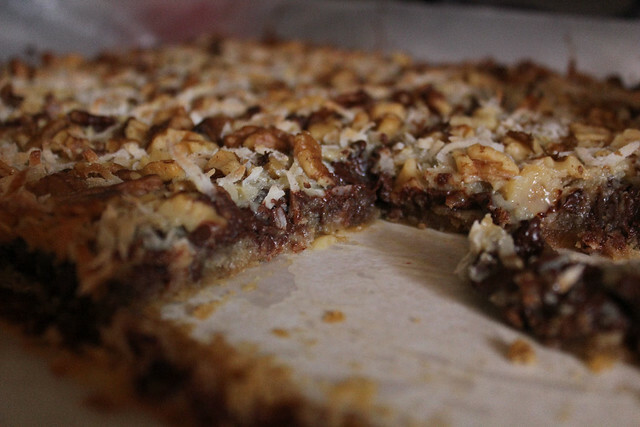 Cut into bars or diamonds. Store covered at room temperature. 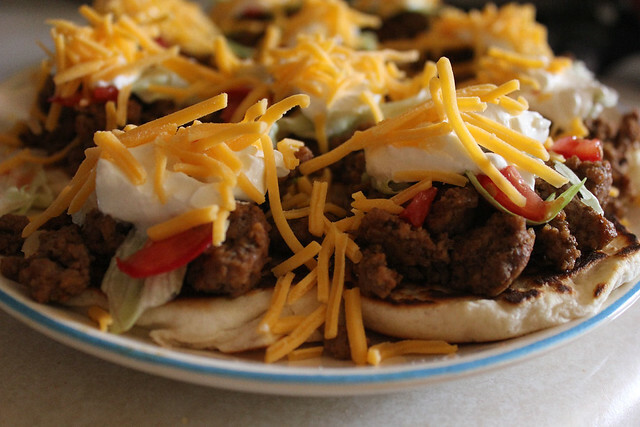 Nothing special, nothing difficult, just some mini tacos using Refrigerated Biscuits. 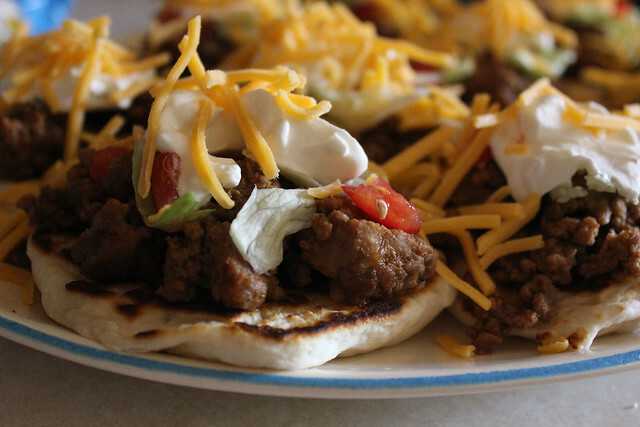 I've made some Flatbread Tacos before also using Refrigerated Biscuits and you can find that recipe right here. 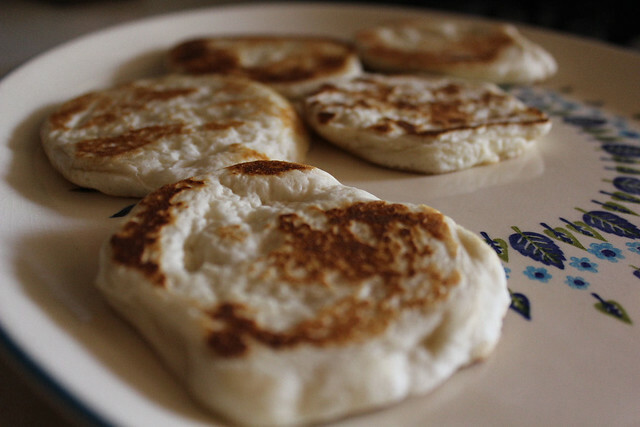 But these were just done a little different, for one, the biscuits were the small ones, I didn't stretch them as much and I also didn't fold them, so in actuality it's almost like a little tostada. All you need is 1 lb of ground beef, a little bit of water about 3/4 cups if that, 1 packet Taco Seasoning, 1 tube of refrigerated biscuits. Then for the toppings whatever you wish: lettuce, tomato, sour cream and shredded cheese. Pull out the biscuits and flatten them with your hand, I stretched them a little not too much, but I wanted a size a tad bigger than the biscuit. 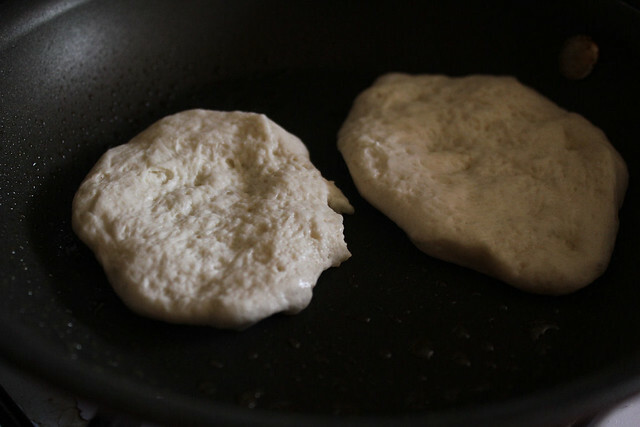 In a small skillet, spray with non stick spray and then cook the biscuits on each side for about a minute or two, they cook real quick and you don't want to burn them. In another skillet, brown the ground beef, when done drain, add the taco seasoning and the water, simmer for about 3 minutes or so. 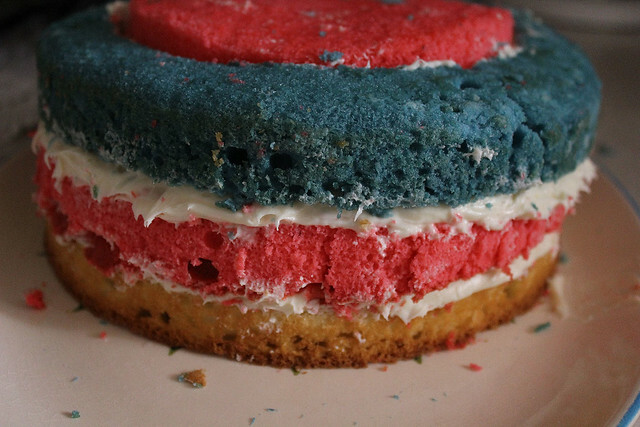 4th of July is upon us yet again, but this year I wanted to make a different cake than the one I usually serve, which is a flag cake made out of strawberries and blueberries OR using blueberry or cherry pie filling to make the stars and stripes. I searched around online and then I saw it. My jaw hit the ground and I thought "NO WAY". I was just completely taken with the cake and even more so when I realized that the creator is none other than Elissa from 17 and Baking. 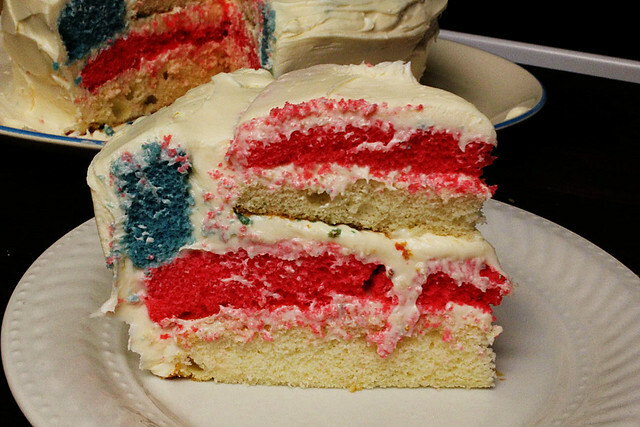 Yeah folks, a now 19 year old, Elissa and her dad came up with this creation for the 4th of July and if you've never seen it before, you're going to flip out. Just imagine your guests reaction when you serve them a slice of this cake. To make this cake you will need three full layers of white cake, all the same height (make two recipes of cake or two cake mixes - you will end up with four layers so use one for another purpose). One layer will need to be white, one layer will need to be red and one layer will need to be blue. Use food coloring to get desired shade. Bake the layers in 9" round greased and floured rounds. Let cool. Freeze the layers to make them easier to work with during assembly. Split the white layer and the red layer in half horizontally using a long serrated knife. 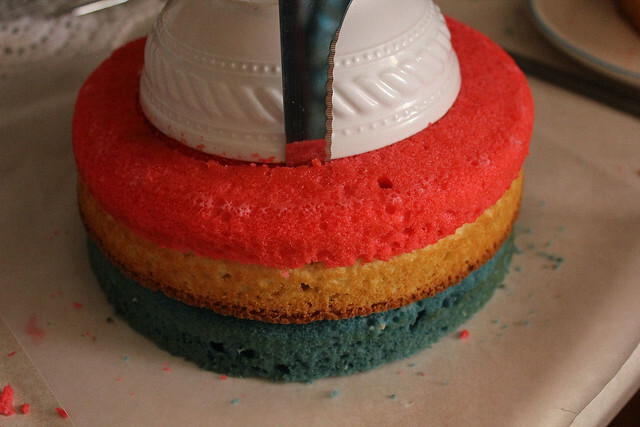 (You can also use a cake leveler to help keep the cut even.) Do not split the blue layer. 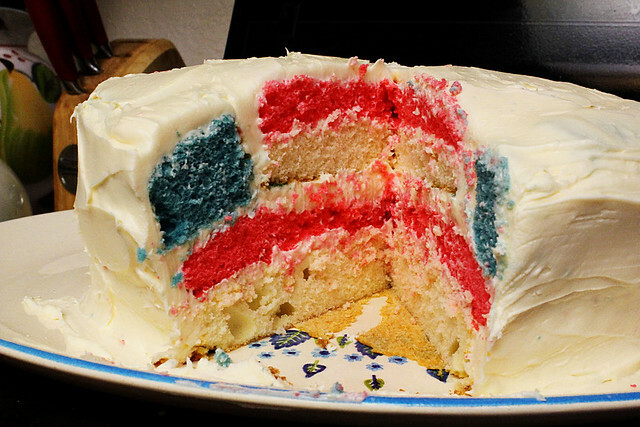 Start assembly by placing one split white layer on a cake plate. Frost the top of this layer using white icing. 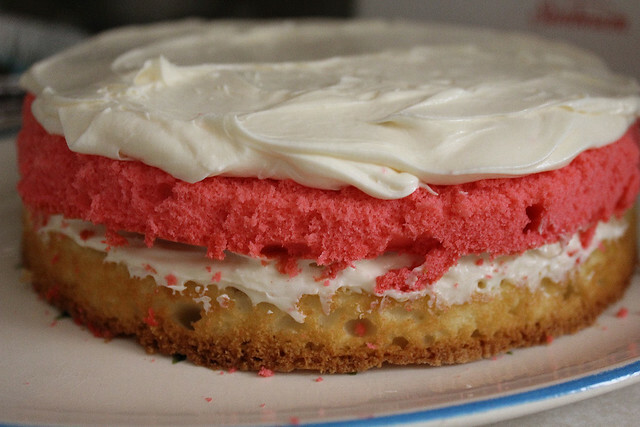 Place one of the red split layers on top of the frosted white layer and frost it with icing. Set aside. Place the remaining red split layer and the remaining white split layer on top of the full blue layer. Place a round bowl (or paper pattern) approximately 5" diameter on the top of the cakes in the center and cut through all the layers using the bowl as a guide. You should now have a circle cut through the layers. 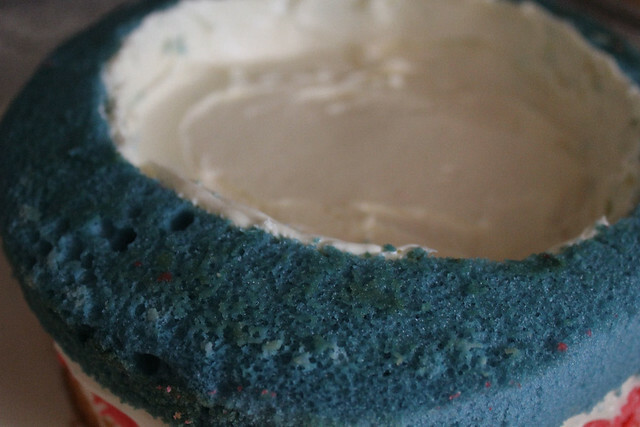 Keep the center red circle, the center white circle and the outer (approximately 2" wide) blue cake ring. 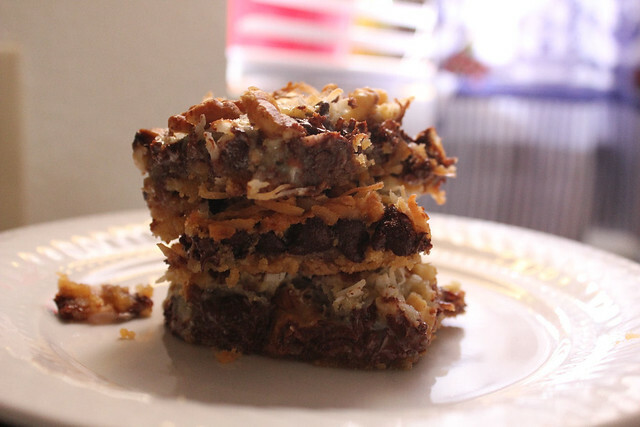 Set aside all other cake pieces for a different use. 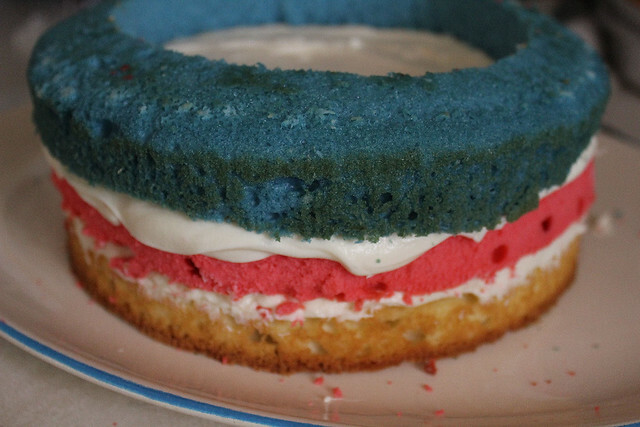 Place the outer blue cake ring piece on the iced white and red cake layers. Carefully spread icing around the inside of the blue ring. Insert the round white cake piece in the center of the blue ring and ice. Insert the red round cake piece making sure it is flush with the blue cake ring. 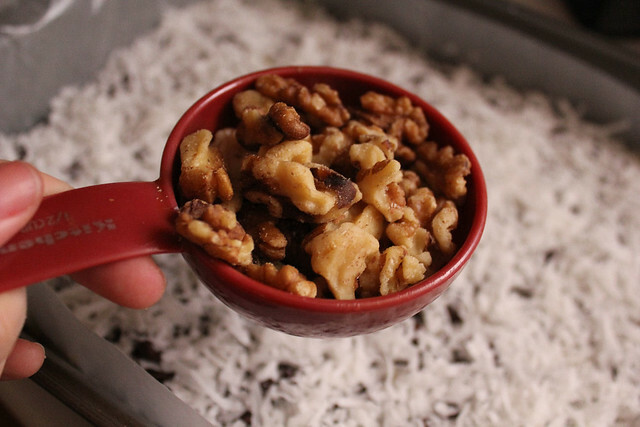 You should now have a complete cake ready to ice. 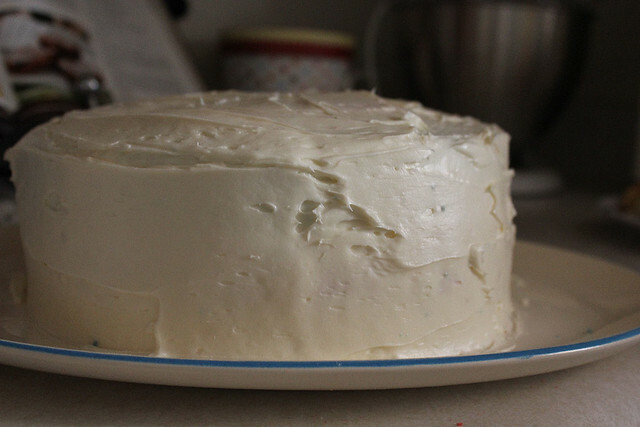 Finish by icing the entire cake with white icing and decorating as desired. 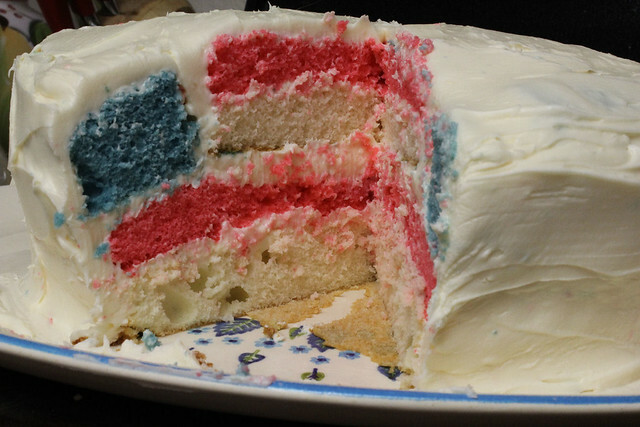 To serve, cut into slices and be amazed at the cool flag each piece becomes!